The saola is a forest-dwelling ungulate found only in Vietnam and Laos. 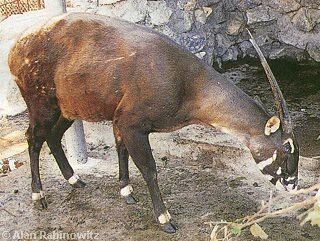 The genus name Psudoryx comes from the saola’s similiaries to the Arabian and African oryx, and the species name nghetinhensis refers to the two Vietnamese provinces of Nghe An and Ha Tinh. The common name “saola” is from a Vietnamese name meaning “spindle horn.” Hmong natives call the saola saht-supahp which means “the polite animal,” as it is reported to be very quiet. It was discovered in 1992 in the Vu Quang Nature Reserve of Vietnam (and is therefore also known as the Vu Quang ox), but it can also be found in Laos near the Vietnam-Laotian border. There was some controversy over its eventual inclusion in the subfamily Bovinae, and its discovery was considered so noteworthy that it was given its own tribe, Pseudorygini. As a forest-dwelling bovine, it is shaped to move through dense cover. It has certain unique characteristics such as its namesake long spindle horns and unique facial glands. It may, in fact, have the largest maxillary-preorbital glands of any extant mammalian species. These glands have a muscular flap over the muzzle which has led some people to refer to the saola as the antelope with “gills.” The animal will flare its glands as a threat, and the glands secrete a foul odor that may be used as a defense mechanism and as a territory marker. The saola is classified as endangered by the IUCN (2004), and estimates for current populations are in the hundreds. 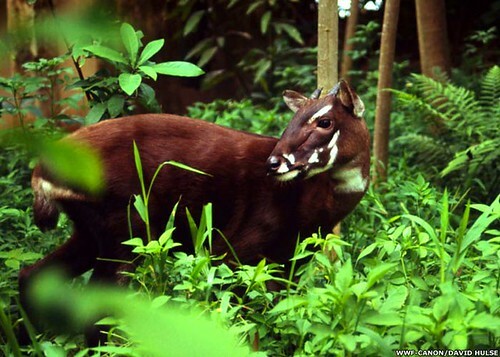 The saola is very threatened by forest destruction in the region as well as hunting and medicinal use of its glands. Schaller, G., and A. Rabinowitz. 1994. 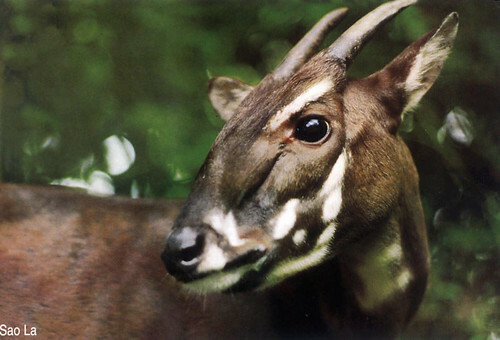 The saola or spindlehorn bovid Pseudoryx nghetinhensis in Laos. Oryx 29: 107-114. Obara, H. 1994. A new species of living bovid from Vietnam. Biological Sciences (Tokyo) 46(3): 155-158. Dung, V. V., N. N. Chinh, A. Ebregt,and C. Santiapillai. 1995. The status of the newly discovered large mammal, the long-horned bovid, in Vietnam. Tigerpaper (Bangkok) 22(2): 13-19. Feiler, A., and T. Nadler. 1997. Recently discovered mammals in Vietnam: Present results on taxonomy, zoogeography, status and on the protection of the animals (Mammalia). Zoologische Abhandlungen Dresden 49(9-21): 331-335.